Elegance abounds at the privately owned Wolf Run Ranch bar. Photo courtesy of Corey Kopischke. Whether you prefer yours straight up or with a twist, the comforts of home are just more appealing than a dingy watering hole where patrons search for solace from the trusty barkeep. While many residents of Steamboat Springs turn to their own home for an entertaining venue, the enlightened few bring a historic flair to their bars. “We (ended up finding) a bar that filled up the whole room,” Scott says of the 24-foot solid structure. The back bar features ornate carvings within the two massive columns framing the antique mirrors. The front bar was merely a shell that the couple recently completed with a wine refrigerator, copper-pounded countertops and a washbasin. “We (originally) brought over the old bar from El Rancho but all the veneer was rubbed off from the cowboys kicking on it every day,” Scott says. On a hunting trip to Iowa last year, Bryan and Christy Cressey – owners of the 3,200-acre ranch – hired an antique dealer who located the bar that originated from somewhere in Wisconsin. “After (Christy) bought the bar, I had to add antique items to the room to make it all work,” Tricia says of the reclaimed wood floors, the 19th century saloon front doors and a blue chandelier hanging in the corner. The space originally was intended as a warm-up room but they’ve thrown numerous charity events there, as well as their own parties. “Chris Diamond and I had a great birthday party there – he turning 60 and me 50,” Tricia recalls. A fire destroyed the Cressey’s original indoor riding arena four years ago. They’ve since rebuilt it bigger and better. From inside the lounge, next to the hand-picked Yampa River rock fireplace, patrons can pull up a barstool to the viewing windoand observe all the equestrian activity. The entire structure nohouses an 18-stall barn, 100-foot by 150-foot indoor riding arena, a bedroom and bathroom attached to the western-style lounge. Many of the historic bars around Routt County seem to originate from some forgotten place, have a tall story and were built in a bygone era, the facts and specifics getting lost in translation over the years. Judith Harrington, previous owner of the Harrington Ranch in the Elk River valley, says she and her ex-husband found a bar built sometime in the 1800s and decided to build a saloon around it. “The saloon was his baby.It was one of a kind. It really had a bar ambiance. We didn’t have any couches or any sort of lounge area, just tables,” Judith says. While the Harrington’s only used the bar and saloon for family/friend occasions, they’ve hosted a handful of large events, like a Strings in the Mountains outdoor concert and Lyon’s Club function. You won’t find a bar stool at this Western saloon. You simply mosey over and step up. Since the backdrop of the bar was too tall for the first floor of the saloon, John altered the building, tearing out a bedroom upstairs that noshows off the three antique chandeliers, gold tile ceiling and a loft space above. With a poker table, a pool table and old barrels of liquor behind the massive bar, it has been returned to the “old western saloon that it once was,” John says. 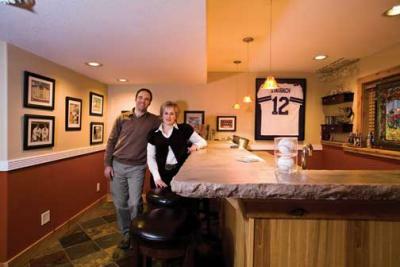 Tim and Beth Bishop shooff their home bar, designed with the sports fan in mind. Photo courtesy of Corey Kopischke. Old black-and-white photos create ambiance in Tim and Beth Bishop’s home in west Steamboat. Patrons of the Bishops’ bar can sip a drink amongst photos of historical sports legends like Joe DiMaggio, Babe Ruth and Jackie Robinson. “You can find a lot of Yankee history here,” says Tim, a long-time Yankees fan. “We have real, handwritten score cards from 1942 with Joe DiMaggio in the lineup and authentic Saturday Evening Post covers from 1913 that all have a sports theme,” he says. Added memorabilia includes autographed baseballs and wooden bats, antique hockey skates, ski programs from the 1920s and large framed black-and-white photos of Mohammad Ali and Babe Ruth. Tim says his most coveted collection is the Mickey Mantle autographed memorabilia. “He’s not just a baseball great, but also a relative on my mother’s side of the family,” Beth says. To add another personal and “old” element to this adult and kid-friendly home sports bar, Beth inherited her grandparents’ old claw-foot bar tables from Ohio. “They owned a club there in the 1950s, and it was everyone’s favorite place to go. The table was once used for poker and noserves as our family gathering place for card games,” Beth says. “We even have an old photograph of ‘Club" 13,' as it was called, that we plan to hang in the bar for a different sense of history." Every Christmas Beth's father gives more antiquated and authentic sports artifacts and photos with some link to history. And as years go by, the Bishops add to this family-style hall of fame by including sports items used or gathered through their immediate family; son Koby's recent ticket to the Rockies first-ever go at the World Series hangs behind the bar. The ancient Greeks created luxurious bathhouses for exercise, rejuvenation and entertainment that also housed art galleries, meditation rooms and lecture halls. Like the Greeks, Yampa Valley residents are building their own elaborate indoor rejuvenation centers. Sounds of Serenity: fiber optic waterfalls in Bonnie and Mark Porter's pool eases the body and mind. Photo courtesy of Corey Kopischke. Instead of art in her bathhouse, Mary Litterman houses art in her pool. The mural, SYLPH, based on a smaller work by Nancy Jeffrey, divides light and dark, night and day. A skeletal creature, dragonfly and lizard slip between worlds, spiraling them together with wings and tails. The poolroom is roofed in glass, so the pool becomes the focal point of both the dining room and living room that look down upon it. Adjoining the pool is a hot tub that seats 10, making it easy to slip from warmer spheres to cooler. 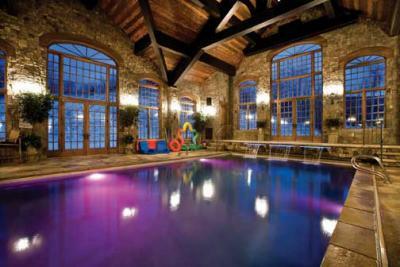 Bonnie and Mark Porter’s recreation room houses a 20’x40’ pool perfect for parties. A fiber optic waterfall in three sections gives a feeling of movement and calm among the chaos of so many (they have five kids including triplets). The colorful lighting behind the waterfall can be changed for any occasion. Twenty-foot high windows give views outside, while a projector plays movies on a drop-down screen for entertainment inside. Lounge chairs surround a fireplace for warming up after a swim. “We love that we can use it year-round,” Bonnie says. 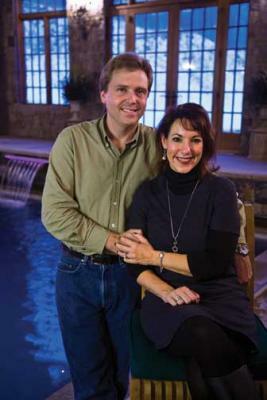 Bonnie and Mark are smiling for a reason - they use their recreation room to rejuvenate. Photo courtesy of Corey Kopischke. Being able to exercise indoors throughout the winter is also a major factor for Dave and Jeanie Douglas, who incorporated an Endless Pool into their sun room. An Endless Pool is an 8’x15’ water ‘treadmill’ with an adjustable countercurrent to allofor a water workout. With jets in the rear and an adjustable thermostat, the pool also becomes a therapeutic spa. Floor-to-ceiling glass windows enhance views of rain pattering down, or snofalling softly. “If there is magic on this planet, it is contained in water,” writes Loran Eisely, in The Immense Journey. These families have created their own healing spaces for relaxation and strengthening. What started with the Greeks 15 centuries ago is being improved upon today in the Yampa Valley.